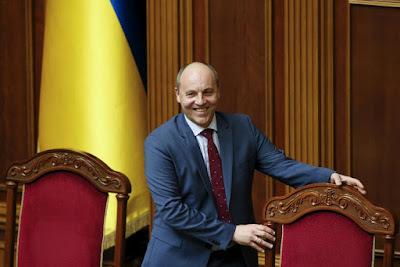 KIEV, Ukraine -- The speaker of the Ukrainian parliament, Andriy Parubiy, has declared that joining NATO is a strategic goal for the country and that parliament is wholeheartedly behind the initiative. Newly-appointed Ukrainian Parliament speaker Andriy Parubiy stands by his chair, Kiev, Ukraine, April 14. Ukraine largely maintained a non-alliance policy in the years following its 1991 independence from the Soviet Union. However, following Russia’s annexation of Crimea in 2014, Kiev has pushed for deepening ties with the West. A new government formed during the recent crisis declared NATO membership a goal for the first time since Kiev affirmed its non-aligned status in 2010. Ukrainian President Petro Poroshenko signed a decree in February, opening the first official NATO representative office in Ukraine. Only seven parliamentarians had voted against that initiative. While NATO membership requires Ukraine to complete the reform programme its defense forces are currently undertaking, the fact that it does not have full control over its territory, with Russia in control of Crimea and pro-Russian troops holding parts of east Ukraine, may complicate membership. “I am convinced that for Ukraine, at the time of Russian aggression, NATO membership is the strategic direction of our development,” Parubiy told parliamentarians at a meeting with NATO officials. “There is no alternative to this direction,” he said, according to news site Ukrainskaya Pravda. NATO first signalled it was prepared to eventually welcome Ukraine in the alliance in 2008 at a summit in Bucharest, although Ukraine would then elect a pro-Russian government that put this process on hold. “I highlight today that for us the decision at the Bucharest summit on the advancement of Ukraine into NATO remains in power and all of us, the whole of parliament, is convinced that Ukraine will be a NATO member,” Parubiy said. “This is a matter of time, but for Ukraine this is a fundamental matter not only in the military dimension, but also in the strategic and geopolitical dimension.” Parubiy said that without international pressure on Russia, Ukraine would not be able to regain lost territories, news agency Unian reported. “Within the framework of the political dialogue between Ukraine and NATO, we have to focus on a strategy to restore the territorial integrity of Ukraine,” he said. He called for NATO to maintain high military readiness and pressure on Russia, in support of Ukraine and as a precaution from keeping Russian forces away from allies in Eastern Europe. “Putin understands only the language of force,” Parubiy said. Poroshenko has estimated that the majority of Ukrainians now support integrating into NATO when this figure was only 16 percent, around three years ago. He has also vowed to hold a referendum on the question once the reform package his government has promised to implement is complete. European Commission President Jean Claude Juncker recently said that Ukraine would not join the EU or NATO in the next quarter of a century.